The choice of data series to use in trading strategy development may impact results significantly. In this article we investigate the impact of dividend-adjusted data in the case of three strategies developed by DLPAL. It is shown that the choice of data series may lead to wide divergences in results depending on markets under consideration. This subject is too broad and there are possibly no general rules or conclusions. Some markets are easier to deal with, for example forex, because there are no dividends and no splits. In the equity markets there are dividends and splits and in the futures markets there is drift induced in continuous series. The last two markets pose several challenges to trading strategies developers. Needless to say that some developers are not even aware of these problems. Specifically, some blindly believe that using adjusted data for splits and dividends is appropriate in the case of equities and some others think that continuous back-adjusted data in the case of futures are more appropriate. However, careful analysis may show that this is not the case. Note that the in-sample and out-of-sample for TLT are reversed because of the length of history. 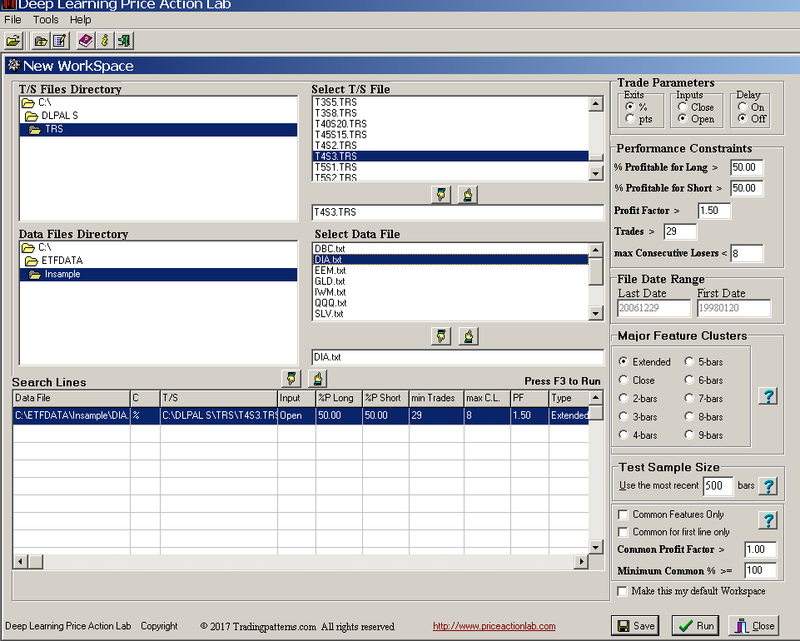 We use DLPAL S to develop strategies for the three ETFs in the in-sample to subsequently test in the out-of-sample. The aim is not to develop robust strategies but to determine how the choice of data series impacts the results. DLPAL S identifies parameter-less price patterns in historical data based on user-defined performance criteria and risk/reward parameters. Unlike other program that use naive combinations of pre-programmed indicators stored in a database, DLPAL S identifies patterns in price action based on a proprietary unsupervised learning algorithm. Then, the performance of the patterns is evaluated and the output is a list of those patterns that fulfill the criteria. A strategy is developed by combining all patterns using the Boolean OR operator to minimize selection bias. Since all patterns have the same general structure and there is no selection from the results, data-mining bias is minimized. Note that the bias will never get to zero as it is inherent in any process of developing trading strategies, whether automated or manual. The target and stop-loss percent for SPY were both set to 2.5% and for TLT to 1.5%. For DIA the target was set to 4% and the stop-loss to 3%. These were decided after using the price series analysis tool with in-sample data. A pattern has emerged: the number of long patterns increases with adjusted data while the number of short-patterns decreases. This should be expected since dividend adjustments introduce upward drift in adjusted data. The second step in the analysis is to look at performance in the sense of total returns in the out-of-sample. As stated in the beginning of this article, our intention was not to develop robust strategies but to study effects of data series. This is also the reason for the long out-of-sample periods. For example, in the case of DIA, the in-sample covers 8 years but the out-of-sample covers nearly 11 years. Below is a table of out-of-samples total returns. Note that the performance in the out-of-sample was backtested in Amibroker platform using adjusted data. DLPAL S generates code for the Amibroker platform that can be copied and pasted in the backtester. A new pattern has emerged: in all three cases performance is lower in the out-of-sample for strategies developed with adjusted data. Below are the Quantopian results in the case of DIA. Click on images to enlarge. It may be seen that the DIA strategy developed with unadjusted data outperforms SPY buy and hold in the out-of-sample by a significance margin. This is despite the long out-of-sample period. The out-of-sample performance of the strategy for DIA based on unadjusted data is about three times higher than that obtained in Amibroker. This large deviation can be attributed to the differences in backtesting on daily and one-minute data and may be a random result. Can we draw any general conclusions from the above study? Of course not. The intention was to show that in some cases strategies developed with adjusted data are inferior to those developed with unadjusted data and this is the important result. Quants must keep this in mind and test various options for their markets under consideration. Although dividend adjusted data are known to introduce drift, their use may result in better strategies in some cases depending objectives and structure of signals. In the case of DLPAL, it appears that for some markets, split-adjusted but not dividend-adjusted data are a better choice. Careful analysis may help in making the right choice between the two types of data series. You can download a free two-month fully functional demo of DLPAL S from this link. For more articles about DLPAL and DLPAL PRO click here.